Located quite centrally in the city, this iconic park is frequented by many office go-ers, homemakers, children, families and friends. If you’re looking for a place for your evening jog, a park to entertain your children and buy them balloons, or just a fix for your boredom when you’re tired of Netflix and chillin’, this park is the answer to all of it. But of course, you can’t stay all day at the park. When you’re done exercising or lounging, treat yourself to street food in the locality, and thank us later. This tiny but popular chaat stall serves some delicious though inauthentic dishes. As the owner of the stall believes old is gold, he only sticks to the mainstream dishes like Aloo Puri, Sev Puri, Masala Puri, Tomato Chat, Bhel Puri, but gets them exactly spot on! Make sure you try their Masala Puri for just INR 25. You’re likely to go in for a repeat order. And then maybe repeat run after the indulgence. A walk in a park is barely ever complete without a plate of steaming hot, satisfying momos. 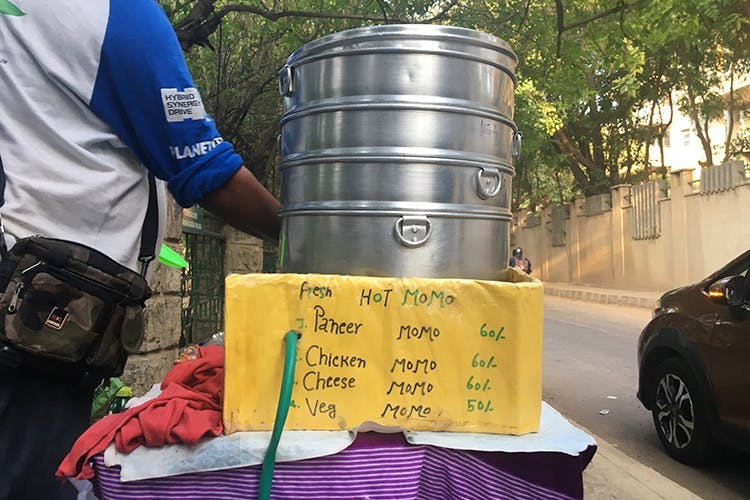 This momo stall (or rather table), just outside the park sells variations of momos. There’s a vegetarian option which is mostly cabbage and onions, a paneer version and a cheesy one for the vegetarians. There there’s the usual chicken, our favourite. Each plate is served with two sauces – chilli and peanut, both of which are spicy and make a good dip for the momos. Although these stalls are commonly found in Bangalore, this particular stall is right by the entrance/exit of the park, and lures you with their unique and interesting take on the regular old dosa. With options like Palak Paneer Butter Masala Dosa, Schezwan Jain Paneer Butter Masala Dosa, if you’re feeling indecisive, try their most popular item- Pav Bhaji Butter Masala Dosa. This particular stall seems to be the most popular and is always swarming with a crowd around. Steaming hot idlis and crispy paddus accompanied with spicy chutneys, of course. And the best part if that you get a plate for just INR 20. Drop in after work for a quick snack, or pack up some paddus for the night and don’t worry about dinner, as they can be quite filling. If you’re a health freak and the other options don’t appeal to you, head to the fruit stall with an assortment of fresh fruits being sold. Mangoes, watermelons, bananas, grapes, apples, oranges and pomegranates – you’ve got yourself a fruit salad. You could also get some freshly cut jackfruit to eat right there.